One of the ways we can keep God's Word on our lips and in our thoughts is through Scripture memory. Meditating on Bible verses fills our mind with good things and builds our faith. Scripture memory was common in my home growing up and now that I have children of my own I want to continue the tradition. In the past, I have failed to plan ahead. I picked a few verses on a whim that me and the kids would memorize them. We'd make it fun with hand motions, games, and prizes. Eventually though, all the good intentions flew right out the window when picking a scripture didn't come easy. I am doing my best to make this year different. I created an outline for the next 12 months that will help me stay consistent. Every month I will focus on a new topic and each week I will choose a new memory verse that applies to that topic. Here's the plan for 2013. To keep track of the verses I'm introducing, the kids will be writing them down on index cards. Then they can decorate them with stickers, crayons and magic markers. Just to make sure the kids (or I) don't loose them we'll putting them on a ring. Here is how I made my My Bible Verses cards on ring. It costs about $7 at Staples but I made them with some supplies I had at home. Does your family memorize Bible verse? 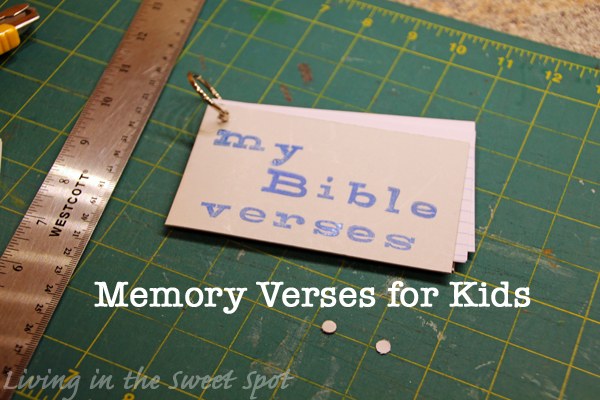 Any tips you have for making scripture memory it fun and easy? Update: These cards are free to download, however, If you prefer the convenience of receiving these cards professionally printed, trimmed, and delivered to your mailbox, you can purchase them in my Etsy shop. In addition, I am offering new cards, in the form of a monthly subscription, as a printed or digital version. The first set ships in August 2015.